Everyone who has heard these performances comments on how exciting they are, characterized by a spontaneity that only comes from a sophisticated reading of the score, and a willingness to risk everything. One critic has characterized the stunning Op. 70 performance as "miraculous. . . a performance as fine as any I've ever heard. All four movements of this extremely difficult piece [are] exemplary, missing not a single opportunity for great beauty and technical panache." 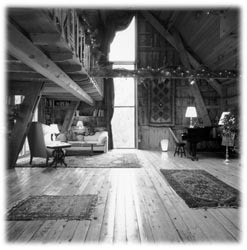 The 1997 festival CD will be available at the Barn.